The Prostate Cancer Information Group of Tehachapi is honored to have Dr. Ricardo Salas, M.D., M.P.H., as the guest speaker at 6 p.m. Thursday, April 25 at the Adventist Tehachapi Valley Hospital, 1100 Magellan Drive in the Executive Conference Room. The Association of Realtors held their general membership meeting April 4. The guest speaker was Christina Scrivner, Adventist Health Tehachapi Valley Foundation manager. The Writing Great Fiction workshop with Lauraine Snelling will be held April 27, from 9:30 a.m. to 3:30 p.m. at the Tehachapi Treasure Trove, 116 E. Tehachapi Blvd. The Kiwanis Club of Tehachapi announces that Tehachapi Mayor Susan Wiggins will be the featured speaker at the Kiwanis 33rd Annual Prayer Breakfast on May 2. A native of Mojave and a Tehachapi community leader, Wiggins will share her personal story and vision. The Tehachapi Police Foundation invites the public to join us as we host the third annual banquet to honor the Officer of the Year, Civilian Employee of the Year and Volunteer of the Year. The Tehachapi Symphony, directed by Dr. David Newby, will perform Sunday, May 5. The concert begins at 4 p.m. at Country Oaks Baptist Church, located at 20915 Schout Road. When I heard Marilyn Meredith had published a new novel set in my hometown of Tehachapi, I was excited to read the book. The Greater Tehachapi Chamber of Commerce held a special celebration at Kohnen's Country Bakery to celebrate its 15th anniversary on April 12. Tehachapi High School's drama class is proud to present "Flowers for Algernon" starting May 2. Tehachapi Loop Railroad Club held its spring Model Train Show in Tehachapi on Saturday and Sunday with layouts that were larger and more exciting than ever before. The Judkins sisters, who have been entering the Tehachapi Valley Art Association's All Youth Art Contest for many years, took home the top prize in each of their age groups. California Poppies are orange, like pumpkins. Everyone knows that. Except when they are not. Also like pumpkins, California Poppies can be white too, and every conceivable shade of orange and yellow in between. 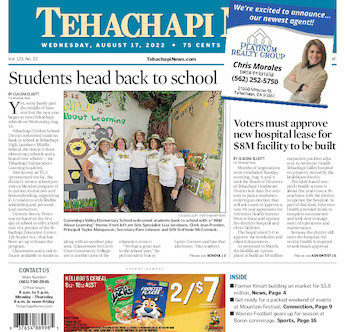 There's much to do around Tehachapi — community events, arts and entertainment and more. Check out our weekly calendar. New Life Pregnancy Center is offering childbirth classes to help expectant mothers prepare for labor and delivery. Trains have been traditional gifts for young and old alike. The Tehachapi Loop Railroad Club would like to share their toys with all of you at their Spring Model Train Show to be held from 10 a.m. to 5 p.m. Saturday, April 13 and from 10 a.m. to 3 p.m. Sunday, April 14. It's time to include man's best friend in the fight against cancer as the American Cancer Society's Bark For Life returns to downtown Tehachapi April 13. The 35th annual BVS Cultural Arts Association Art Show takes place this year from April 14 to 21. The opening reception will be held from 4 to 7 p.m. April 14 at the Oak Tree Country Club, and that is when we have the drawing for the five pieces of art that our generous artists have donated. The Ridgecrest Chamber Music Society will present the final concert of its 2018-19 season Friday, April 12, with chamber music performed by the Felici Piano Trio. Native Americans, fur trappers, explorers and others who spent time surviving in the arid West knew a simple way to begin a search for water: first look for some willow trees.